If you’ve been counting calories for a long time, chances are you know the secrets to portion control and where to find the tastiest low-cal products. But sometimes you simply get the “munchies” and yearn for a substantial snack or meal that is still low in calories. For large, low-calorie meals, make non-starchy vegetables the main ingredient and combine them with smaller amounts of lean proteins, whole grains, fresh fruit and healthy fats to create large meals that satisfy your hunger but won’t wreak havoc on your diet. A low-calorie version of the classic chef’s salad fills a huge bowl without breaking your calorie bank. Make lettuce and other shredded fresh vegetables the bulk of the meal, and top them with lean proteins like kidney beans or skinless poached chicken. The Centers for Disease Control and Prevention notes that a large quantity of vegetables can be added to bulk up a meal, especially those with a high water content like spinach, cucumbers, tomatoes, zucchini, mushrooms and sweet peppers. 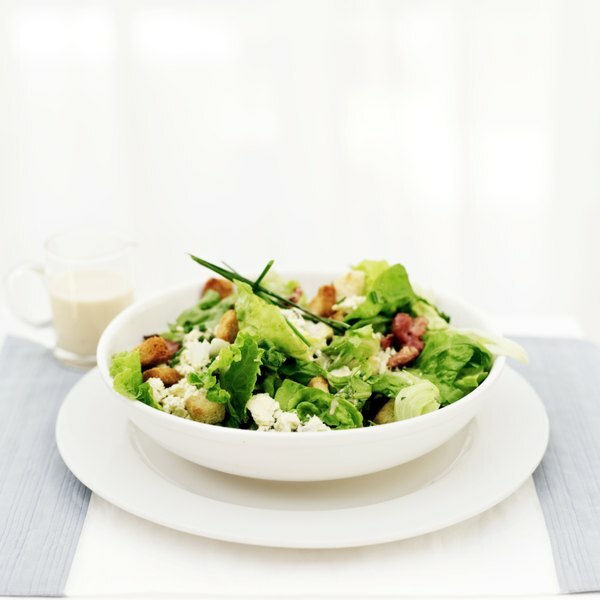 Dress the salad with lemon juice or a diet, vinegar-based salad dressing, and pair it with skim milk and a few whole-grain crackers to provide a complete meal. The Centers for Disease Control and Prevention suggests consuming broth-based soups as part of a low-calorie meal plan. Adding vegetables with a high water content, as well as a small amount of lean protein, allows you to create a main-dish meal containing a broad range of nutrients without having to worry about portion control. Choose low-sodium vegetable or chicken broth to form the basis of your meal. Canned low-fat chicken vegetable soup contains only about 58 calories per cup, so a large 3-cup serving would be under 200 calories. With skim milk and four whole-wheat crackers, the large lunch is still only about 340 calories, allowing you to have seconds on soup or crackers and still keep the meal under 500 calories. Fresh vegetable platters allow you to munch to your heart’s content without worrying about piling on the calories. The classic crudités platter uses raw vegetables, but you can create a similar one with fresh fruit, or mix the two. Use low-fat yogurt or cottage cheese to make sweet or savory dips, or sprinkle vegetables with lemon juice or vinaigrette. Among the lowest-calorie fresh foods that also work well as “dippers” are cherry tomatoes, carrot sticks, zucchini spears, celery, cucumber, watermelon, cantaloupe and strawberries. Raw veggies like carrots and celery average about 30 calories per cup, while fresh fruit averages about 50 calories in each cup. A 4-ounce serving of nonfat yogurt has about 65 calories. The possibilities are endless when combining whole grains with lean proteins and vegetables, but any of the “one-bowl” meals combining all three elements can be eaten in large quantities when you focus on the vegetables and avoid fattening elements such as butter or cream sauce. Try whole-wheat noodles tossed with scallops and spinach, dressed lightly with pureed basil and olive oil. Rice, beans and sautéed vegetables, topped with salsa, is also a classic choice. A 1-cup portion of combined brown rice and kidney beans contains a total of 215 calories. Combined with a ½-tablespoon drizzle of olive oil and 2 cups of mixed cooked vegetables, a large bowl for your main-dish meal is about 500 calories.